We find out how e-ink screens (used by the Kindle) compare with LCD screens (used by iPad and most smartphones). 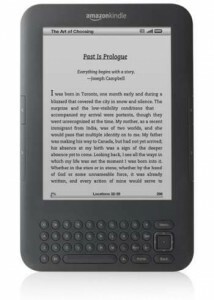 The Amazon Kindle e-book reader (available from £111 on Amazon.co.uk) differs from most tablet devices in that it uses an e-ink screen as opposed to a colour LCD screen. Fundamentally, e-ink is a very different technology from LCD. In this article, we look at how e-ink and LCD display technologies work and compare the two technologies. 1 How do electronic ink (e-ink) displays work? 2 How do LCD displays work? 3 What are the advantages of an e-ink display? 4 What are the advantages of a LCD display? 5 Which display technology is better? 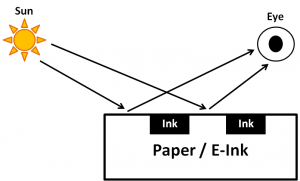 How do electronic ink (e-ink) displays work? E-ink (electronic ink) displays produce images and reflect light in the same way normal paper does. Paper reflects light from the Sun (and from artificial light sources such as light bulbs). Because paper reflects light of all wavelengths, it normally appears white (see left diagram below). In order to form an image on paper, we need to add a layer of ink in the relevant places. This layer of ink is non-reflective (this region appears black as black is the absence of light; see right diagram below). By selectively adding ink to a piece of paper, we can form the desired image. In electronic paper, we are able to electrically move ink particles across the surface of the screen (using something called electrophoretic technology). Power will be consumed in moving the ink particles. However, once the image has formed no further power is required to keep the image on the screen. This means e-ink readers such as the Amazon Kindle are very efficient as they only use power during “page turns”. 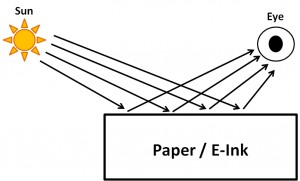 E-Ink: Paper reflects light from the Sun (left diagram). By adding a non-reflective ink layer onto the paper, we create a dark region on the paper (right diagram). E-ink displays are based on this principle. 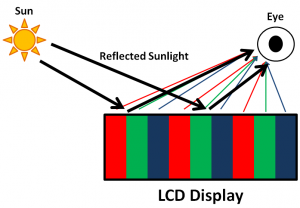 How do LCD displays work? An LCD display consists of lots of small light emitting crystals. The crystals come in sets of three colours (red, green and blue). A combination of these three colours is used to produce all other colours (see left diagram below). By changing the intensities of the red, green and blue crystals, we are able to change the colour which is displayed on the screen. In this case, the screen is backlit (the source of the light is the screen itself). For this reason, LCD displays consume power whenever they are turned on. When outdoors, e-ink screens are much easier to read than LCD screens. Photo from Amazon (who manufacture the Kindle which uses e-ink). Aside from power consumption, one downside of LCD displays is that they’re hard to view outdoors in direct sunlight. The surface of the screen is reflective and so the light emitted from the LCD display needs to compete with the reflected sunlight (see right diagram below). In order for text on the screen to be legible, the light from the LCD must be brighter than the reflected sunlight. In bright sunlight, the reflected sunlight is often stronger than the light from the LCD display making it difficult to read what’s on the screen. To compensate for this, smartphones such as the Apple iPhone and Samsung Galaxy S II contain an ambient light sensor which will automatically increase the brightness of the display when you’re outside to compete with the reflected sunlight. LCD displays can also have an anti-reflection coating to reduce reflected sunlight. 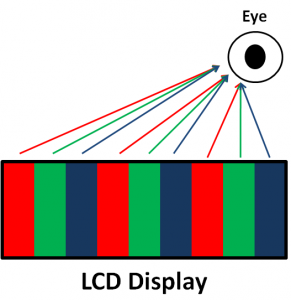 LCD Display: An LCD display consists of lots of red, green and blue light emitting crystals (left diagram). One of the problems with LCD displays are that they’re hard to view outdoors due to reflections (right diagram). What are the advantages of an e-ink display? E-ink screens (left) are designed to closely emulate ink printed on paper. For this reason, they produce much crisper and better looking text than LCD displays (right). Photo from Amazon (who manufacture the Kindle which uses e-ink). Better visibility outdoors. E-ink displays make use of ambient sunlight unlike LCD displays which must compete with it. If you’re looking to read on the beach, e-ink is a must. Less eye-strain with e-ink. E-ink displays should give less eye-strain. The experience of using an e-ink display for an extended period of time should be similar to spending an extended amount of time reading a paper book. Reading from a LCD display is more similar to reading from a computer monitor or watching TV for an extended amount of time. Lower power consumption. E-ink displays only consume power during “page turns”, whereas LCD displays consume power whenever they are used. This is why e-book readers such as the Kindle can last several weeks between charges whereas tablet devices and smartphones need charging on a daily basis. What are the advantages of a LCD display? Full colour with the ability to view multimedia. Unlike e-ink, LCD displays are more versatile and are able to produce a full colour image. They respond much faster than e-ink (e-ink displays take a long time for the screen to redraw) so it’s also possible to enjoy rich multimedia experiences such as movies on an LCD display. Whilst colour e-ink displays are on the way, the colour still isn’t great and they’re still too slow for video. With an LCD display, you’re able to enjoy all kinds of multimedia – with an e-ink display you’re really limited to books. More intuitive user interfaces. 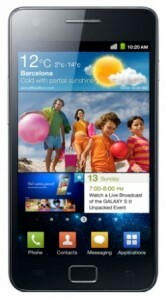 LCD displays are often coupled with a capacitive touchscreen in many phones and tablets. This means it is possible to build much richer and more intuitive touch screen interfaces. Can be used in the dark. As LCD displays are backlit (they produce their own light), it is possible to view them even in low light conditions. This means you can watch movies in the dark, etc. Which display technology is better? Display technology is an important consideration when choosing a new mobile device. The “better” technology really depends on what you’re looking for. If you’re looking for an all-round multimedia device, you’re better off with an LCD display device such as the Apple iPad, Apple iPhone, Samsung Galaxy Tab or the Samsung Galaxy S II. These devices give you a rich multimedia experience: they’ll allow you to consume text, pictures and video with vibrant colours and fast response times from the display. If you’re looking for a great device specifically for books and text, the Kindle and its e-ink screen will give you much better visibility outdoors and lower power consumption. In the future, we envision the “ideal” tablet device could have an e-ink display overlaid on top of an LCD display. Text would be displayed using the e-ink layer whereas graphical elements would be displayed using the LCD layer. Such a device really would give the best of both worlds: great readability outdoors as well as a full multimedia experience.